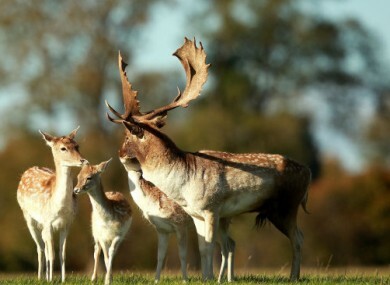 Fallow deer during the rutting season in the Phoenix Park, Dublin. AN ANIMAL RIGHTS campaign group is to protest at an upcoming awards ceremony because a group that advocates blood sports has been shortlisted for an award on the night. The pro-blood sports lobby group RISE (Rural Ireland Says Enough) says that rural Ireland now faces “a threat to a distinctive form of recreation”. However, the Campaign for the Abolition of Cruel Sports (CACS) says it is “appalled” that a group that advocates hunting animals for sport has been nominated for an award at the ‘PR Awards for Excellence’, being held on 17 June. CACS said that it objected to the nomination “not just because it promotes blood sports, but because it has misrepresented the true nature of these activities”. As an example, the animal rights group said RISE had “claimed erroneously and repeatedly” that deer did not suffer when pursued in carted stag hunting and that the activity posed no risk to road users - claims it says are “utterly false and easily refuted”. It also said that the group did not deserve the nomination on the basis that it had failed in its objective to prevent the banning of stag hunting with hounds. Anti-blood sports campaign groups will “protest peacefully” outside the venue hosting PRII’s Gala luncheon and awards ceremony, the Conrad Hotel at Earlsfort Terrace in Dublin on 17 June. The Irish Council Against Blood Sports has also called on the Public Relations Institute of Ireland (PRII) to drop the RISE campaign from its 2011 Awards shortlist. RISE has dismissed the concerns of animal rights campaigners, saying that their assertions have “no basis in science or research; quite the contrary”. The video below, released as part of the campaign by the Irish Council Against Blood Sports, contains images some viewers may find disturbing. Email “Protest planned as blood-sports group shortlisted for award”. Feedback on “Protest planned as blood-sports group shortlisted for award”.